As some of you may have picked up on I used to be a partner and the chef of a prominent upscale eatery in Lancaster City. I've been hearing from a lot of people lately that they would happily sacrifice small and insignificant body parts for the original Grilled Caesar Salad dressing recipe. I don't really have any need for small body parts so I decided to just post it here! *Note- I consider this recipe to be my intellectual property and I'm publishing it for non-commercial use only. Method: Chop shallot, garlic, anchovy, and oregano finely and mix all ingredients. You must use Parmigiano-Reggiano for your Parmesan cheese. It must be shaved paper thin. The flavor is different if it is shaved too thick. An inexpensive Chablis makes a fantastic cooking wine and ingredient in recipes, particularly because it is not aged in oak. Black pepper is best when freshly and coarsely ground. When hand mixing the dressing with a whisk you should be a bit cautious about dumping all the ingredients together at once. Hellmann's is an extremely strong emulsion but I'm sure it is possible to break it; alternate adding your lemon juice/wine and your olive oil in smaller amounts. Take a head of romaine and strip any limp or damaged outer leaves. Soak the whole head in cold water and shushull(<----note the highly technical culinary term here) it around to clean the leaves and get the sand out(or better yet buy clean organic heads of lettuce). Allow to drain!!! The lettuce must be relatively dry to grill. Cut the head of lettuce in half lengthwise. Use either a brush or spray bottle(the kind you get at the hardware store for cleaning will spray a nice fine mist of canola or light olive oil) or Misto(tm) to lightly coat the flat face of the 1/2 head of romaine with oil. Season with salt and pepper. Now, heat your grill until it is as hot as you can get it without turning it into a molten pile of slag and throw the flat face of the lettuce directly on the grates. Allow the face of the romaine to char for 30 seconds to 2 minutes depending on your personal taste. At the very least the cut edges of the romain should be black. You may want to tap the face of the lettuce on the grill a few times to knock off the whispy incinerated parts. 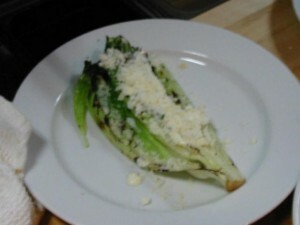 Place the romaine on a plate with the charred side up, spread a healthy dose of dressing on the face and top with Parmigiano-Reggiano. If desired place meat, seafood or vegetables in between the dressing and cheese. Top with your favorite croutons.